CHILDREN'S GALATTA – 6th Edition is one of a biggest children's celebration which is a talent analyzing programme, organized by Justice Mohan Children's University, As a part of Children’s Day JMCU is creating a platform to celebrate such a day with events, activities and celebrations for the Kids. 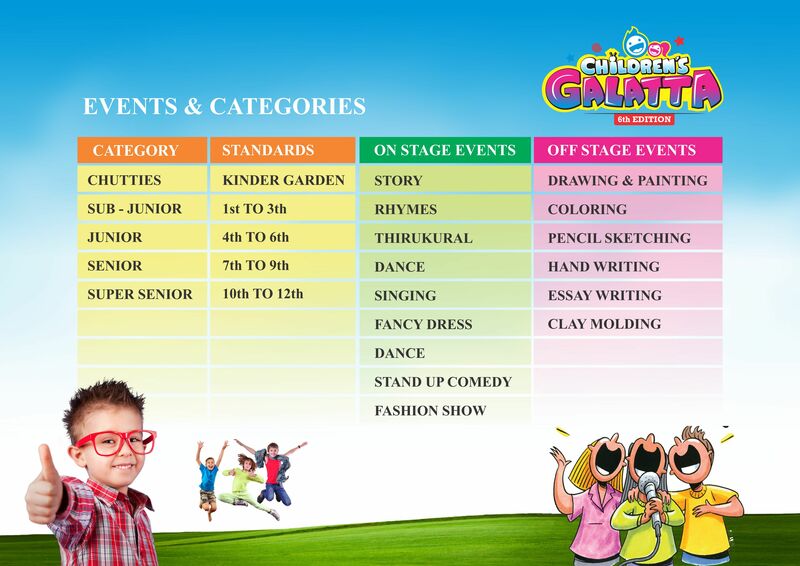 CHILDREN'S GALATTA 2018 will involve children from different schools to display their innate gift on the stage through a series of singing, dancing, arts and much more. The carnival is on the month of November 2018 occuring at pondicherry. The most talented groups and candidates will be rewarded with Certificates, Medals and Prizes to encourage their innovation on aesthetic extracurricular activities and provide a great exposure. Senior – No.of Kurals & Explanation. Max timing - 2 min. PRIZE DISTRIBUTION: 6 pm Onwards. Winners will be selected for the first 3 places in each category/event. Outstanding Performers will be honoured with Trophy, Medal & Certificates. Participation Certificates for all the participants. Registration fee to be paid for each event. Participants should bring their school ID card. The category may or may not be changed before the event. Students can come along with their Parents / Individual or by a Team. The participant will allow performing on the QUE basis according to the number. No food & beverages will be provided complimentary. Best Performer Award will be nominated to the Outstanding Performers. Students should bring their own apparels & accessories for their participation. Cancellation of Registration cannot be entertained, No refund can be made. Organizer reserves the right to admit or refuse any entry without assigning any reason thereof and also to cancel/alter any modifications on all events.